A “promising” teenage rugby player was run over by a gang who beat him with a golf club in what police described as a racially-motivated attack. 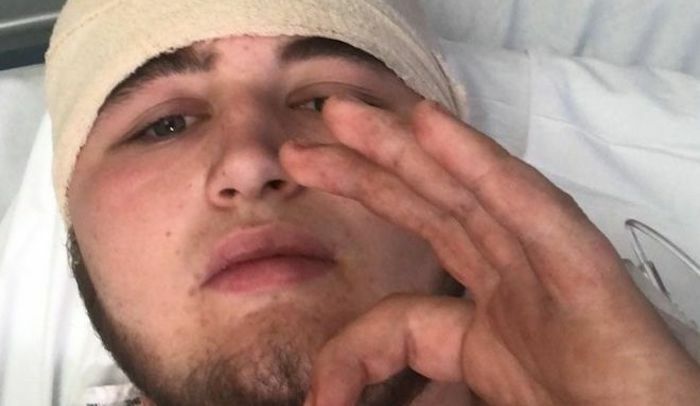 Police said Littleborough RUFC player Matthew Hayden, 17, suffered a fractured skull in the “unprovoked attack” in Smithy Bridge Road, Littleborough, Rochdale, on Saturday. The attackers – described as a group of up to five Asian males – shouted racial abuse during the assault, police said. It is being treated as a hate crime. Littleborough RUFC said Colts junior team captain Josh Jones’s car was rammed by a black Nissan Micra driver at 02:00 BST. Mr Jones, 18, who was trapped in the driver’s seat, was also attacked with a crowbar, causing “significant hand and facial injuries”, said Littleborough RUFC…. In a statement, the club said the trio were “all relieved to be alive”, adding Matthew has undergone surgery on a fractured skull and a bleed on the brain…. Det Insp Mark McDowall of Greater Manchester Police described the attack as “brutal” and “unprovoked”, leaving Matthew with “life-changing injuries”.